Discover which services are exactly what you need. You may need help with understanding how Amazon can best fit your needs, or how to use tools like the Storefront or Enhanced Brand Content to their fullest extent. Whatever your needs on Amazon are, we’re here for you. We’re going to investigate for you, partner with you, advocate for you. Because while we at Cascadia take pride in our knowledge, our primary concern is caring for YOU. Click on the category that best applies to you. Starting to sell on Amazon? While it can seem like you’ve got a gigantic mountain to climb, don’t worry…we’re here to be your guide! Here are some of the services we provide to beginning sellers like you. Before you invest in creating your product, get an honest, actionable analysis from the experts about your product’s potential success and potential compliance pitfalls. If you are struggling to find the right source for the product you want to produce, let us help! We have a sourcing and merchandising team in Shenzhen, China, staffed with former employees of Toys ‘R Us, Target, The Home Depot, and Amazon. Grow and protect your Amazon catalog. Get a detailed evaluation of all your metrics, based on our combined 80+ years working at Amazon. Get improved traffic and a professional look for your listings with our optimization process, inclusive of Amazon focused SEO, new pictures, new page content, and enhanced content creation for brand owners. Get a custom Storefront created for your brand – basically a website/landing page on Amazon itself. Now you can direct traffic directly to Amazon, whose conversion rates are second to none. Ready to grow your listings? If you’re tired of solo trekking in your selling journey, then let’s do it together. You’ll get all the support you need to succeed with selling on Amazon. Get coaching and guidance if you’re struggling with your account performance, particularly if you regularly get ASIN suspensions and want to reduce the headache. Get coaching and guidance if you’re struggling with launching your products, growing your product line, or need support getting past that $1-5MM annually hump in your PL business. Get coaching and guidance if you’re struggling with your sales and marketing performance. We manage your PPC, listings, and performance, plus expert consultation. Book a few hours to talk with one of our Amazon experts about your ideas and get their feedback. Choose how many hours you'd like below. Work with the most experienced team. Our team is currently made up primarily of former Amazonians. Between us, we have over 60 years of experience in compliance, testing, private label development, logistics, marketing and advertising, just to name a few. From the service provided perspective – Cascadia’s service is simply excellent. Their highly responsive team gives concise explanations to any matter. Professionally, all of the consultants have been on the other side (Amazon). Each of them specializes in their own field, but all know how things work on Amazon. In addition, they know how things need to work in order for you, as a seller, to succeed on Amazon. They want things to work for you. Your success is their success, and they are there to help your Amazon business grow. 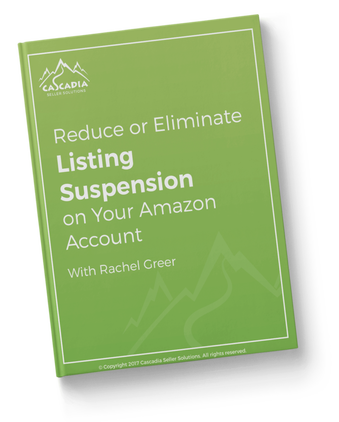 Click the button below to protect your Amazon account with your FREE Listing Suspension Guide.